There's a rule savvy diners seeking the ultimate in ethnic authenticity always follow: Eat where the locals eat. 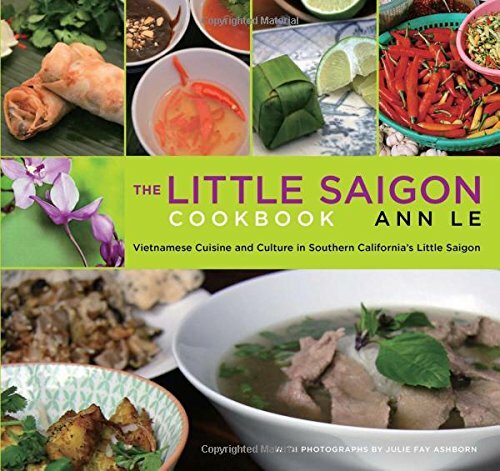 The Little Saigon Cookbook takes you inside the local restaurants in Southern California's Little Saigon, the site of the largest single population of Vietnamese outside of Vietnam. From the French-inspired bakeries, the lunch delis, and the food courts to the weekend mayhem of the Pho house and wedding receptions at the boisterous seafood restaurants, these are the extraordinary meals that Vietnamese diners and others in the know enjoy every day. The Little Saigon Cookbook offers dozens of family recipes, many surviving through oral history alone. It takes readers on a tour of culinary landmarks and introduces them to the wealth of authentic dishes found in Little Saigon―from the hot and crispy Vietnamese crepes down Bolsa Avenue to the crunchy, tangy chicken and cabbage goi salad from the Asian Mall. Ann Le has lived most of her life in the area of Southern California known as Little Saigon, where her family moved in 1975 after the fall of Saigon. Julie Fay Ashborn’s travels through Southeast Asia have inspired her photography in the books To Asia with Love, To Vietnam with Love, and Communion: A Culinary Journey Through Vietnam.